For a project to run smoothly, you have to have a team member assigned to every task and make sure each of them knows what to do. Depending on how complicated your project is and how many people are working on it, this can be hard. This is where constructing a Responsibility Assignment (RACI) matrix can help. This Six Sigma tool helps you to clarify the roles and responsibilities of the team members and ensure that someone takes care of every step of the process. What Exactly Is the Responsibility Assignment (RACI) Matrix? This is where RACI matrix comes handy. It’s a responsibility charting tool that specifies not only who is responsible for a given task, but also the role of each person involved in it. By constructing a RACI matrix, a project manager can make sure that the team members stick to the specific roles he or she wants them to take. It helps avoid any kind of confusion about roles sometime down the line for the project. Essentially, RACI matrix is a project management tool. RACI stands for Responsible, Accountable, Consulted, and Informed – the four roles assigned to team members. The tasks are normally listed in the first column of the matrix and the team members are listed in the top row of the table. Responsibility charting through creating a RACI matrix brings clarity to what every team member has to do in the project. In addition to that, it serves as a check on what should be done and who’s ought to be doing what in the future. “Responsible” refers to the person who actually completes the task – aka “the doer.” There always has to be at least one Responsible per each task. If you are missing an R in any of the rows of the matrix – you have a gap that has to be filled immediately. “Consulted” is the adviser for the given task or entire project. Normally, this is the subject matter expert whose opinion you seek before making the final decision or action. Keep in mind that you should keep the number of C’s to the minimum for each row. Having too many consultants can slow down the process significantly and add unnecessary deliberation and idle discussion. Too many C’s can raise the risk of poor performance. “Informed” are the people you keep updated on how the process is going. These would be the people who you will notify once the task is completed and who will take action as the result of the outcome. There can be as many “informed” as necessary per process. You usually have only a one-way communication with these people. The first thing to do when charting a RACI matrix is to identify the specific work process. In this step, you want to focus on the high impact areas first. Improving performance in those area brings more benefit for the whole business overall. You may also want to focus on the processes that seem to underperform because of role confusion. If you feel that too many people do the same task or there is a slack because team members interfere in the tasks that’s not theirs, this could mean that this work process needs a responsibility chart. Chose a process that is not set to change in the nearest future. Be sure to completely define the work process. A chart for a work process should include between 10 and 25 tasks. Otherwise, it may be that your definition of the process in question is either too narrow or too broad. In this step, your goal is to determine every task within the process that someone has to be responsible for. Avoid obvious, generic sounding, or meaningless tasks – like “go to meetings” or “write reports.” The point of RACI matrix is to see whether each important task has a “doer,” not give meaningless assignments. In this step, it would be useful to consult the people directly involved in the process. By conducting some sort of one-to-one interviews with the senior team member or simply brainstorming with the team, you will have a better grasp of the whole process. This will ensure that you don’t miss any important details. Also, when listing the activities, try to be as specific as possible and use action-oriented language. This will help to keep the focus of the team members in the future. Here, your job is to see who are the people assigned to each task. The list of people can include those directly working on the project as well as people from other departments or outside the company. It would be better if you do not list specific people, but rather specify which roles are involved in the process. E.g., instead of putting “Ben” in your list of people, put “Project Sponsor.” Specific people working on the process may change, so listing roles rather than people makes your RACI matrix more adaptive. This way the chart will be still valid if new people fill the roles tomorrow. As a general rule, you should start filling out the squares with “R’s” – Responsible – as these are usually the people directly responsible for the output. Next, move on to the “A’s” – Accountable – since these would be the people ultimately answerable for the process. The last step is to determine the “C’s” and the “I’s” – Consulted and Informed. These people would not have direct responsibility for the project but are still related to it. Once you complete the RACI matrix, distribute it among the team members that did not directly participate in its creation and ask them for feedback. Capture their opinions and revise the chart to see if there are any changes you have to add. This way you’ll make sure that you don’t miss anything important and have all your team members on the same page about their responsibilities. It’s crucial you discuss and agree on the final version of the matrix before you begin working on the process. Does one role have too many responsibilities? Can they be assigned to someone else? Do you have the appropriate number of Consulted and Informed per task? Does every task have an Accountable and a Responsible? If you have some particularly complex tasks, is one Accountable enough for smooth decision making? Finally, remember that as you work on the process, you will have to constantly reevaluate and update your RACI matrix. Some parts of the project may change with time, and you have to note these changes in the chart. RACI matrix is a simple and elegant tool that helps everyone to keep track of their roles and responsibilities. This chart protects you from role confusion and makes it way easier to run your projects smoothly. It’s simple and clear structure shows who does what on a high level and can be especially helpful when creating a team charter. 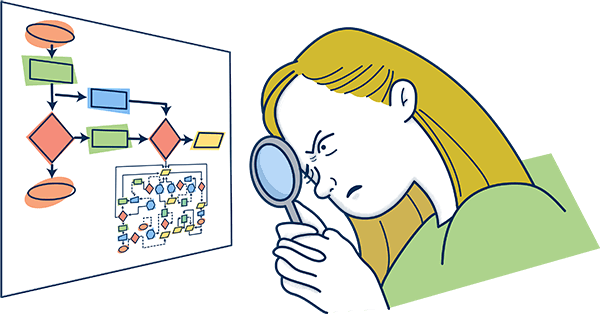 If you’re looking to graph more complex information than simply the task responsibilities, though, then you might want to look into business process mapping. Have you used a RACI matrix for your project? Was it useful? Let us know how it went down in the comments! Video Guide – Why and how do to-do apps help you? Video Guide – What is a change request?